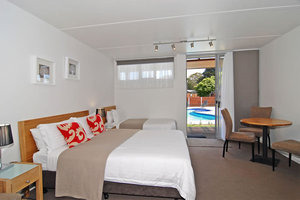 These motel suites in Ocean Grove are just a short walk to the beach and located just 5 minutes drive from 13th Beach and Barwon Heads golf courses. This venue offers motel style accommodation, with recently renovated, spacious suites that can accommodate 2 - 5 guests. All rooms are equipped with kitchenette and have access to BBQ facilities and a great pool & spa area. Perfect for the social golf group booking.